Nintendo has been walking a fine line with Samus ever since the horribly misogynistic Metroid: Other M achieved universal scorn for its unfair treatment of the iconic female bounty hunter. Many were wondering how her zero suit costume was going to pan out in Super Smash Bros. for the Wii U and 3DS after Brawl‘s iteration dolled her up, and the game’s marketing focused primarily on her perfectly shaped posterior. The new design is a fine mix, making sure that the core elements of a tight blue jump suit are there and yet focusing more on her pistols, gun-shoes, and ability to just lay waste to enemies like Samus should. And then we have these alternative costumes. Granted, I won’t call them out for being too revealing like some are. 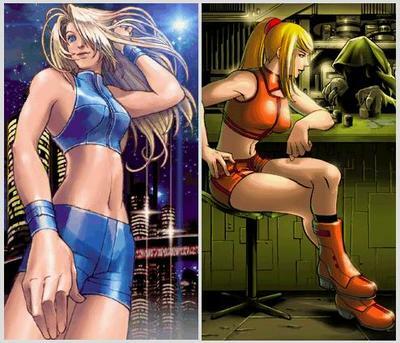 They come off more as gym clothes than anything else, but also remember that Samus has worn these before in the endings of Metroid Fusion and Metroid: Zero Mission. They are tributes to Metroid‘s legacy just like everything else in the game. Director Masahiro Sakurai also was sure to point out that Zero Suit Samus has a female character artist working on her behind the scenes in his Miiverse update, just in case you’d like to know. Sakurai’s hint that development is nearly wrapping up is also a sure fire bet that everything that has been imagined to be in the game is already in there. If they barely have time to take off Samus’ clothes, I doubt they can add any other late minute changes.